With the third rail electrification entering service on the Epsom Downs branch on 17th June 1928, a new era was taking shape for the Epsom Downs branch. Whilst the reason for actually building the line, i.e. horse racing, was still of some importance at that time - Pullman, first class and Lord Derby's specials continued to use Epsom Downs until 1939, and Pullmans and first class specials were resumed after the war until 1953 (Kirkby, 1983) - it was already becoming quite clear that commuters would soon become the main source of income for the Epsom Downs branch. Nearly four million houses were built in England between 1919 and 1939, the vast majority of which (nearly three million) were built in the growing areas of suburbia and offered for sale, not rent. The number of owner-occupied houses in Britain thus soared from around 750,000 in the early 1920s to more than 3,250,000 by 1938 (Gardiner, 2010), and the countryside along the Epsom Downs branch saw an increasingly intensive building activity which btransformed it into a residential area. In 1927, the line had seen the purchase of 3'000 season tickets - by 1933, this figure had grown to 13'000 and was still rising (Kirkby, 1983). The coming of the Southern Electrics not only heralded a change in appearance of the traffic on the line, but the traffic itself was, in fact, changing. As of 1928, platforms at Belmont and Banstead were extended accordingly to accomodate 8-car trains (Kirkby, 1983), increasing the number of available seats to the rising number of daily passengers travelling on the trains. 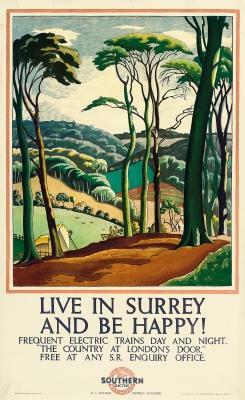 The Southern Railway - created on January 1st 1923 by the amalgamation of the LB&SCR, LSWR and SE&CR as set out by the Railway Act of 1921 - had a policy of actively encouraging people to consider moving to such newly developed housing estates, and whilst its poster proclaiming that you could "live in Kent and be content" is no doubt the best known, the SR's advertising department also put out the slogan "live in Surrey and be happy". 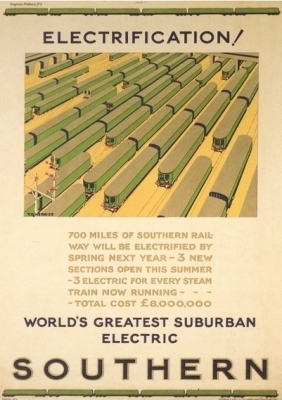 Other advertisment campaigns highlighted the efficiency and cleanliness of its electric multiple-units in comparison to steam, as well as the frequency of its services to and from London. The housing boom created huge numbers of commuters, and in the years preceding World War II, the railway almost had a monopoly in handling that traffic. The originally A.C. overhead service between Sutton and Victoria was converted to third rail during 1929 and officially opened on 6th July 1930, from which date trains also ran to and from Epsom Downs, giving commuters a further choice of destination in the City by travelling either to London Bridge (as before) or London Victoria (Kirkby, 1983). With the introduction of the EMU service on the line, Epsom Downs became a motorman's signing-on point, and the abundance of platforms was put to use by stabling electric stock overnight. In 1938, for example, six 8-car trains were stabled overnight and seven 3-car sets and six 2-car trailers were stabled between the morning and evening peaks (Kirkby, 1983). During the Second World War, the proximity to London exposed the railway line to numerous air attacks as the region around Epsom Downs was under constant pounding of the Blitz throughout 1940/1941. Although the damage caused to the railway branch was limited to a smaller number of actual incidents, it was substantial: on 15th April 1941 a bomb destroyed the original Belmont station building (along with the California Inn across the road, which had been responsible for the station originally being named California), killing 10 people and injuring many more. In July 1941 the railway line suffered another direct hit when a high explosive bomb fell onto the tracks close to the Epsom Downs end of Banstead station and the resulting debris formed of lengths of rail and wooden sleepers hit and damaged numerous houses in the vicinity. During the war, Epsom Downs also saw the stabling of non-regular stock - according to SR and Ministry of War Transport records, a V1 bomb damaged 10 Pullman coaches stored there on July 19th 1944. 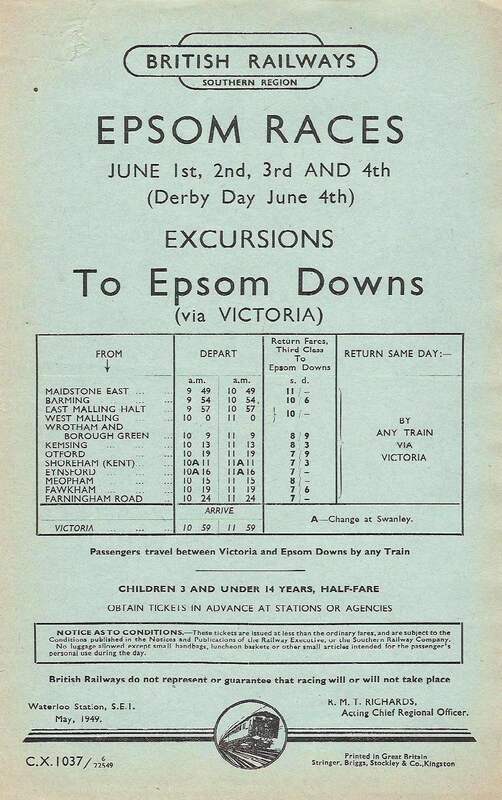 Whilst the service pattern introduced in the early 1930s (with trains running at 20-minute intervals peak and 30-minute intervals off-peak) basically lasted well into the 1960s, the growth of the commuter traffic demanded additional trains from London Bridge to Epsom Downs (Kirkby, 1983). The numerical headcodes for the routes served were "39" (London Bridge - Epsom Downs via West Croydon), "84" (Victoria - Epsom Downs via West Croydon) and "0" (Victoria - Epsom Downs via Mitcham Junction). 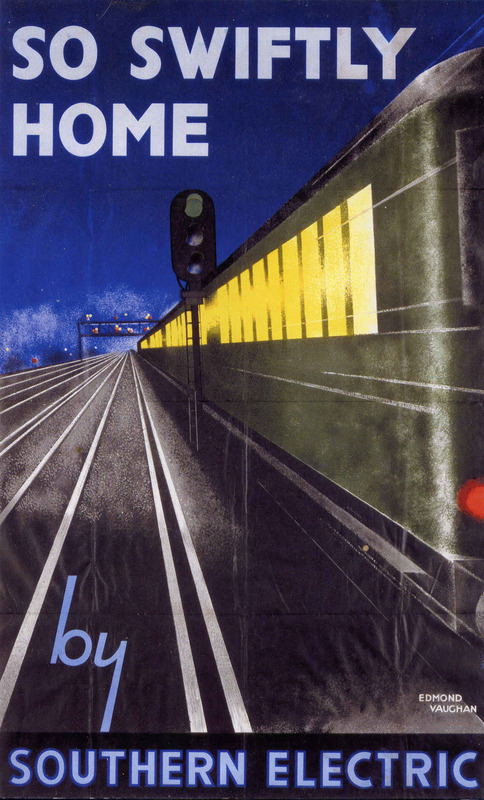 The introduction of the five-day business week in 1958, however, quickly reduced Saturday services to two trains per hour on each route, and regular off-peak services started to attract notably fewer passengers. 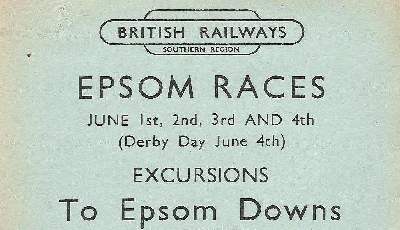 Special excursion trains to the Derby were still run to Epsom Downs by Southern Electric in BR days (this example handbill dates from 1949), but the trains were increasingly run as third class only services. Just as people living in the Greater London area had expanded their living space in the housing boom of the 1920s and 1930s, they were now extending their individual mobility beyond the means and offerings of public transport. Whilst only 15% of all households in Britain owned a private car in 1951, that figure rose to 25% within the next ten years and climbed to almost 50% by 1971 (Leibling, 2008). Motor traffic used for the transport of goods increased in even greater leaps and bounds, and the closing of the goods yards at Banstead in 1964 and Belmont in 1969 (which had still been served by steam engines such a class C2Xs) effectively meant that the line was now passenger-only. All of the London suburban services were beginning to require heavy subsidising, and the governments were putting pressure on the railways for greater economies accordingly. 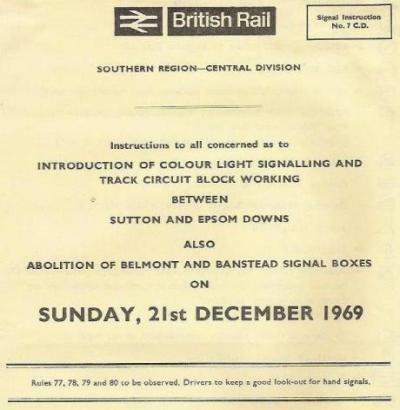 Major cut-backs on the Epsom Downs services were introduced in 1961, with most off-peak trains from London Bridge terminating at Sutton. May 1969 saw the closing of Epsom Downs as a motorman's signing-on point (Kirkby, 1983), and that same month Sunday services ceased on the branch. The platform and track layout at Epsom Downs had always been a paradoxical affair. The great bustling masses of travellers for which it had once been built (and which had only travelled here on a very limited number of days during the year) were now beginning to fade even on Derby days, and throughout the rest of the year the station complex was oversized beyond description. The resulting effect for the (off-peak) passenger arriving at Epsom Downs station could at times have been rather eerie. Possibly even scarier for British Rail, however, was the prospect of having to maintain and service such a large station complex for seemingly no reason. Surprisingly, the nine platform layout had not been cut before and survived for as long as 1969, when finally all platforms other than numbers 4 and 5 (which were renumbered as 1 and 2) were put out of use and the trackwork no longer in use abandoned. 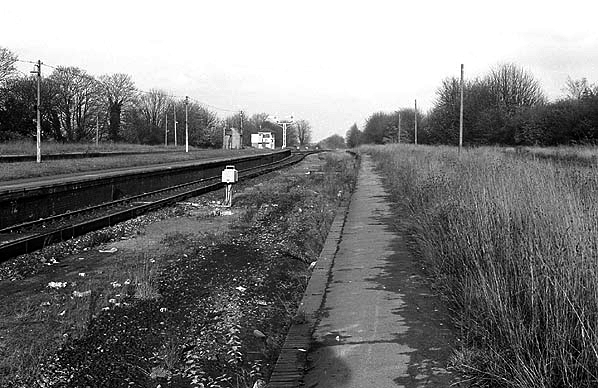 Eventually, the now defunct segments of track would be lifted and removed as the berthing of stock ceased on 1st May 1972 (Kirkby, 1983), but the broad platform structures with their grass centers (built to handle exceptional numbers of passengers getting off and on to trains at the same time) were left in place. For years to come, the abandoned platforms at Epsom Downs would be a silent reminder of what had once been the reason for building the railway - in days long gone since. 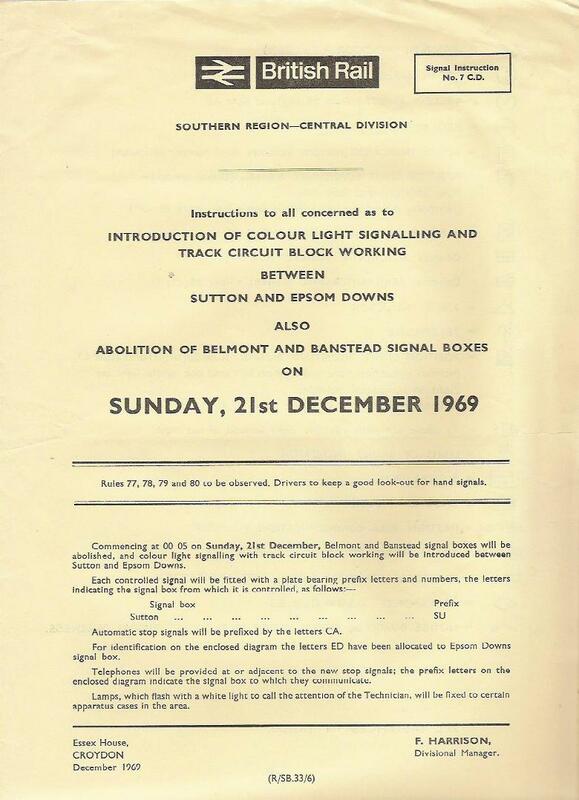 Cutting back the Epsom Downs branch's historic infrastructure also included the introduction of colour light signalling and track circuit block working as of 21st December 1969. As a consequence, the signal boxes at Banstead and Belmont were both abolished. 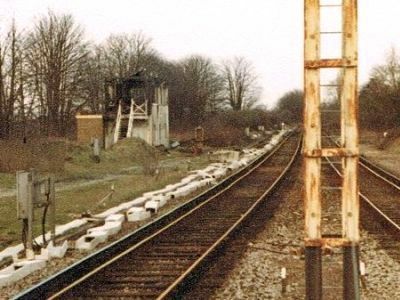 But even at this point in its history, the station at Epsom Downs remained an anomaly as the terminus itself retained its signal box along with most of the existing LB&SCR semaphore signals in spite of the considerabe reduction of tracks. Although lamented by some, the 1969 modernisation measures helped to shape the future of the branch as part of a working railway rather than becoming a museum line - although there seem to have been a few plans and ideas here and there along the lines of the "Bluebell Railway". The station layout at Epsom Downs would undoubtedly have provided an ideal terminus with sufficient storage siding capacities, but none of those ideas seems to have reached the stage of actually finding their way into any official papers, yet alone consideration. Besides, commuter patronage was such that there was no threat of closure, and so the line marched stubbornly on through the difficult era of the 1970s into the brave new world of the 1980s. The Saxby & Farmer design signal box at Epsom Downs, erected in 1879, was finally scheduled to close in 1982 in connection with a general resignalling scheme set up for the area which transferred control to a centralised box (named Victoria even though it was actually located at Clapham Junction). However, the end came sooner - on the night of 16th November 1981, Epsom Downs signal box was destroyed by fire. This was an event which should prove to affect the future appearance of the Epsom Downs branch in a decisive manner. The most immediate effect was that there were no more through trains on the branch from 26th November 1981 until 4th November 1982 as pilotman working was implemented between Sutton and Epsom Downs as an emergency measure. This allowed BR to temporarily operate the line as a single dead-end branch under the "one engine in steam" rule. 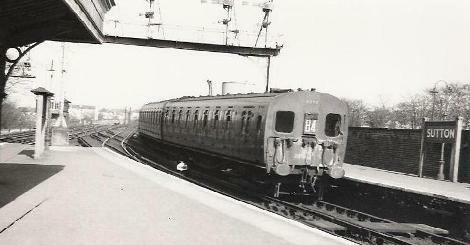 This resulted in a shuttle service between Epsom Downs and Sutton, where all passengers were required to alight and change to connecting trains. On some occasions, this back and forth train service between Sutton and Epsom Downs was operated by preserved 4SUB unit 4732, restored to original green livery and bringing back some original Southern Electrics atmosphere to the line. On 3rd October 1982, the inevitable happened - the singling of the Epsom Downs branchline beyond a point some 40 yards on the Belmont side of Ventnor Road bridge, midway between Sutton and Belmont. The station layout at Epsom Downs retained its previous layout with an island platform serving two tracks as platforms 1 and 2. The rest of the branch, however, underwent a radical visual change as the former Up line was lifted throughout the summer and autumn of 1982. From Ventnor Road bridge onwards, the line now became a stretch of single track over the old Down line, with centralised signalling controlled from the electronic box at Victoria and signals on the branch thus displaying numbers with the prefix VC. Perhaps the planned general resignalling scheme would eventually have had the same effect on the branch, albeit not as quickly. And following the precipitated pruning of the branch, an atmosphere of growing disrepair started to befall many parts of the line. In July 1987 (left), a Cl 455 EMU travels through the cutting alongside the golf course on Banstead Downs. Almost five years since the Up line was lifted, scattered sleepers and lifted track still indicate that this is not how it used to be. Another ten years on, these witnesses would all be gone - first hidden by shrubs which ventured onto what once was a trackbed, and then finally taken away. Through a chain of chance events, the Epsom Downs line was now a modern, "functional" commuter branchline. But there were even more and further changes looming still.